Amidst a struggling economy, political uncertainty and ongoing violence by extremist groups, more than eight-in-ten Pakistanis say they are dissatisfied with the way things are going in their country. More than three-quarters say the nation’s economy is in bad shape and half are convinced that in the next 12 months the economic situation in Pakistan will worsen. Meanwhile, large majorities see their country as plagued by problems such as terrorism, lack of jobs, crime, illegal drugs and corruption. Fully 84% of Pakistanis are dissatisfied with the way things are going in their country, down just slightly from 89% last year. 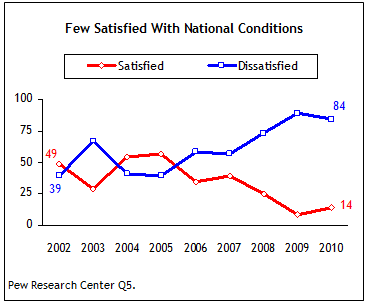 Over the last five years, Pakistani public opinion has shifted dramatically on this question – in 2005, almost six-in-ten (57%) Pakistanis were satisfied with national conditions, while just 39% were dissatisfied. Nearly eight-in-ten (78%) Pakistanis view their current national economic situation as bad, with 58% saying very bad. The situation was quite similar last year, when 74% said economic conditions were bad, including 50% who said conditions were very bad. 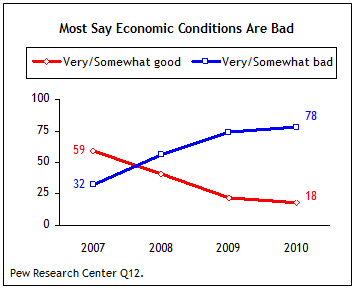 The last time more Pakistanis viewed their national economic situation as good (59%) than bad (32%) was in 2007. Supporters of the ruling PPP (75%) are as likely as opposition PML-N supporters (79%) to view their country’s economic situation as bad. 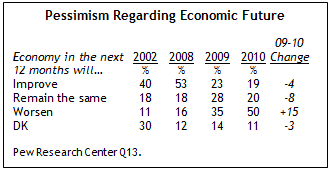 Pakistanis are pessimistic about their short-term economic future. Half say that they expect their national economic situation to worsen a little or a lot over the next 12 months. One-in-five (20%) expect national conditions to remain the same, while only 19% expect such conditions to improve a lot or a little. One year ago, fewer Pakistanis (35%) were pessimistic about their short-term economic future, and pessimism was even less widespread in 2008; at that time, only 16% felt economic conditions would worsen in the upcoming year. Political party affiliation makes no difference in views on the economy in the short-term; about half of PML-N (46%) and PPP (51%) self-identifiers say the economic situation will worsen in the next 12 months. Most Pakistanis see their country facing a long list of serious problems. In particular, terrorism, lack of jobs and crime stand out as issues of concern: about nine-in-ten consider terrorism (91%), lack of jobs (91%) and crime (88%) to be very big problems. Corruption in the political arena also continues to be regarded as a major challenge: Currently, 74% say corrupt political leaders are a very big problem. Last year, a similar share (71%) viewed corruption as a very big problem, while smaller majorities did so in 2007 (64%) and 2002 (58%). About seven-in-ten say illegal drugs (73%), the situation in Kashmir (71%), and access to drinking water (71%) are very big problems (for more on Kashmir, see chapter 4). More than six-in-ten (63%) say pollution is a very big problem, while about half hold the same view on the situation in Afghanistan (51%) and people leaving the country for jobs (47%). More among supporters of the opposition PML-N party than among the ruling PPP characterize Pakistan’s challenges as major. For example, more Pakistanis affiliated with the opposition PML-N consider corrupt political leaders to be a very big problem than do supporters of the ruling PPP (80% vs. 67%). Similar differences exist on views of illegal drugs, pollution, the situation in Afghanistan and people leaving for jobs in other countries. 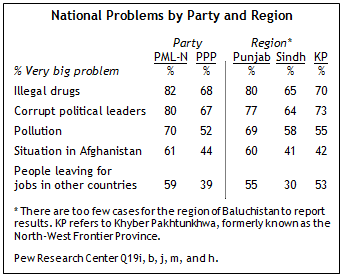 Regional differences in views on Pakistani problems are consistent with the political party divide on these issues. For example, more Pakistanis living in Punjab – a stronghold of support for the PML-N – consider illegal drugs (80%) to be a very big problem than do those living in Sindh (65%) – a PPP support base. This pattern is also evident in views of corrupt political leaders, pollution, the situation in Afghanistan and people leaving for jobs in other countries.